Repairing car dents and paint can cost a fortune. A lot of this damage occurs in parking lots and tight parking spaces. If you don't take precautions when you park then it's just a matter of time before you see a car door ding or two. 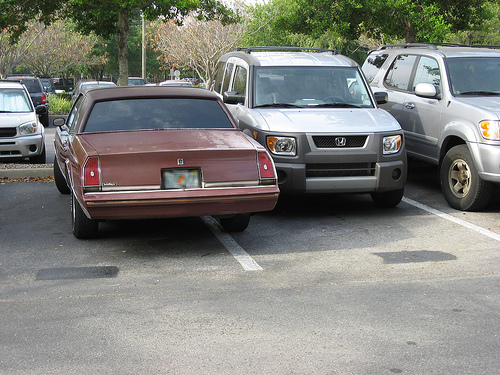 These dents often occur in tight parking spaces like the one in the picture to the right. It's best practice to use bumper and car door protectors when you park in crowded lots. These products protect all common parking lot damage and can save you a lot of dent repair expenses. Many minor dents and dings can be fixed easily without the need for repainting the car. There are professionals in your area that are able to do paintless dent repair with special equipment. Consult with the experts to find out if your dent can be repaired without repainting anything. Prevent parking lot damage and save money on your dent repairs by using bumper guards and car door protectors. Prevent all those annoying dents and dings by just using our door protection products.